Hands up, those of you who daydreamed through a meeting this week. Ants, it turns out, are pretty much on their own. And yet without leaders or directives, these tiny insects are able to achieve all they do through collective decision-making - based on subtle interactions with each other and with the local environment. Clearly this goes against the grain of human hierarchies found in offices and corporations. But could these same ideas be applied to human contexts? 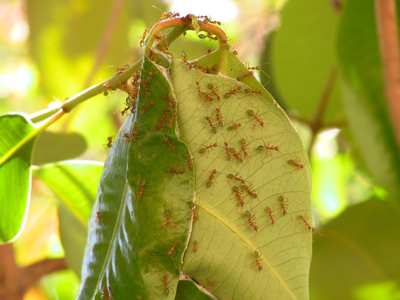 As it is, such ‘ant algorithms’ have already been applied successfully in areas like robotics and computer science. More tellingly, a recent study from Wayne State University showed that modeling management structure on the eusocial insects (ants, bees, termites) was able to foster innovation among staff and raised overall efficiency by 17%. Now before anyone starts chanting ‘we are the Borg, you will be assimilated!’ it should be noted that such structures are not about stifling individuality, but rather reducing micromanagement and freeing up time. So the next time you’re hovering over your employees or about to call that power meeting, you might want to ask yourself whether it’s really constructive. Your time might be better spent on studying how ants work. A modified version of this article was published in THE PEAK magazine.